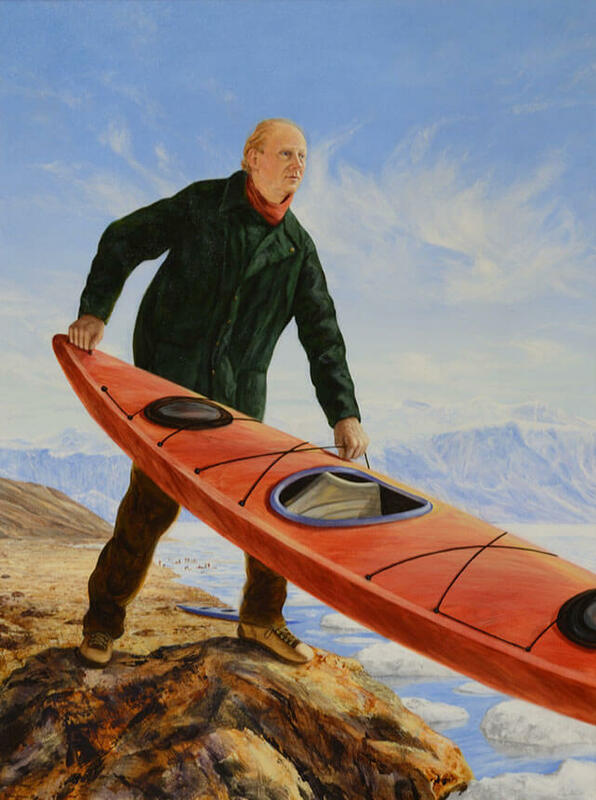 Official portrait of John Ralston Saul in Rideau Hall by Cree artist Kent Monkman. 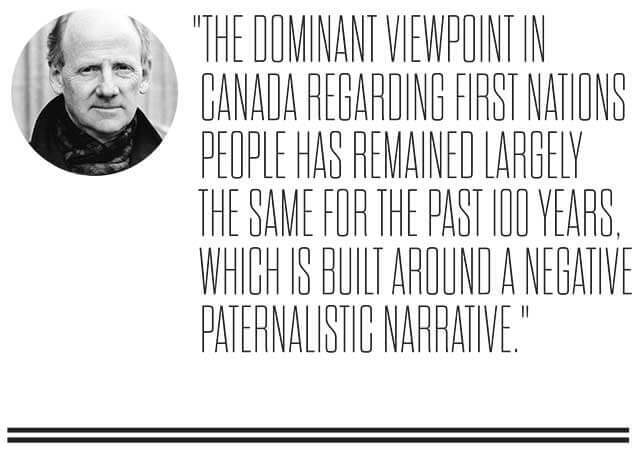 Canadian author and leading public intellectual John Ralston Saul was busy working on other projects when the Idle No More protests sprang up in late 2012. For several months, First Nations protests emerged all over the country, mostly in opposition to provisions tucked into two government omnibus bills that affected environmental and land management policy. Media and pundits were confused by the lack of cohesive demands or centralized leadership coming out of these protests, but Saul saw something more important: The protests were part of a broader re-emergence of aboriginal Canadians into a position of power and influence. As with much of his work, Saul locates Idle No More within 400 years or so of Canadian history. In his 2008 book, A Fair Country, Saul wrote about the egalitarian relationship and strong influence that First Nations people enjoyed with the European settlers for hundreds of years. But this began to change in the middle of the 19th century, as European colonial views about white racial superiority were combined with a precipitous decline in the aboriginal population. Governments began to betray treaty obligations and pass racist laws and policies to assist with this assimilation. But Canada’s First Nations did not disappear, and have worked hard to recover from this terrifyingly low point. Unfortunately, the views of the “pink people,” as Saul describes the 96 per cent of non-aboriginal Canadians, remain stuck in the past. Saul decided to write The Comeback as a clarion call to his fellow pink people to be supportive and part of a new narrative around Canada’s First Nations people. It’s not that aboriginal people haven’t been saying this for a hundred years, he explains repeatedly in the book. It’s that we haven’t been listening. Corporate Knights recently sat down with Saul to discuss the book’s history of Canadian protest movements, the concept of the Honour of the Crown, and lessons for the extractive industry. CK: How would you summarize the average Canadians’ views of First Nations people? Saul: The dominant viewpoint in Canada regarding First Nations people has remained largely the same for the past 100 years, which is built around a negative paternalistic narrative. They’re irrelevant, tragic people that need our help to modernize. Sure, we’ve done some nice things like apologize and trying to offer help, but let’s take a look at some of our most recent efforts on education and financial transparency. First Nations people aren’t wards of the state, but the Department of Indian Affairs and the federal government in general sure act like they are. Yet even as this narrative has persisted, the Canadian aboriginal population has been engaged in a remarkable comeback. The population continues to bounce back, presenting a true civilizational triumph. Graduates are pouring out of universities and colleges at a greater rate than ever before with more than 30,000 indigenous youth currently enrolled. It’s producing a new indigenous elite that is hungry for change and optimistic about the future. That was what most people, who focused on the immediate deliverables, missed about the Idle No More movement: it was a moment where this underground aboriginal comeback broke surface for a brief time, and it is going to continue apace, whether we support it or not. Jeremy: You describe Idle No More as fitting within a rich Canadian tradition of public mobilization. Saul: It’s a very interesting thing because, unlike in most other countries, a great deal of the direction of Canada has actually been set through public debate and protest movements. Go through the history of Canada – from women’s rights leaders like Nelly McLung to the end of capital punishment – or public campaigns to let in larger groups of refugees. All of these movements developed outside of the formal corridors of power in Canada. So something like Idle No More is very much in this tradition of noisy, uncomfortable public movements. Now it comes at a time when people are used to what I call managerialism, the “let’s not talk about it, these are the people who know how to do it” way of approaching governance that has proliferated in recent decades. It also buts up against an atmosphere in Ottawa that is very secretive, very loathe to be part of public debate. CK: Many Canadians were confused by aboriginal leaders’ demands to involve the governor general in Idle No More talks. Why was this request so significant? Saul: It comes down to the difference between power and legitimacy. The prime minister represents power through parliament, while the governor general represents legitimacy. Legitimacy is a much broader concept, enveloping written and unwritten rules, understandings and traditions in a way that outlasts power in Canada. Idle No More leaders wanted the governor general there because she represents the state, the crown, and the people. The presence of the crown invokes the concept of the Honour of the Crown. The court essentially ruled that the crown, through its administration of the country on behalf of the people, has an obligation to act with respect for the citizen. It’s not about the letter of the law, but rather the spirit of the law. First Nations leaders insisted on the governor general’s presence because they wanted to move the conversation away from strict legal commitments towards the ethical and moral underpinnings of the state’s commitments through the treaties, represented through the Honour of the Crown. The treaties were signed by the crown, after all, not the government of the day. We are all treaty signatories. It’s obvious where the courts are going on this – we’re already there and we’re just going to keep going there. Governments have repeatedly used their power over the past 150 years to betray the Honour of the Crown on everything from residential schools to basic clean water provision. So at a certain point, how massively can the Canadian government be in contravention of the law? If I were to phrase this question from the point of view of legitimacy, at what point does the Canadian government lose its legitimacy, because it’s so in contravention of the law? CK: One of the main sources of tension between the federal government and First Nations people involves resource extraction. How should the extractive industry engage with Canadian aboriginal peoples regarding resources on their land? Saul: First Nations groups are used to being presented with the unappealing option to either accept jobs on someone else’s conditions or be viewed as an irrelevant nuisance on the sidelines of the decision-making process. If the extractive industry wants to have a productive relationship with Canada’s aboriginals, they should focus on three key points. The first involves actual jobs training. Aboriginal groups want on-site jobs, sure, but it’s even more important that they involve longer-term managerial positions. For this, you need sustained consultation with the community to set up robust apprenticeship programs of the sort that used to be more prevalent in the Western world. But having on-site and managerial positions only gets you so far. This still sets up an uneven, rather colonial relationship. First Nations groups need to be granted a certain amount of equity in these projects to level out the playing field. This, in turn opens the door to a number of alternative business models. Look at what was agreed to in Haida Gwaii, a development plan with a greater long-term perspective. CK: How does the concept of the Honour of the Crown fit into this? Saul: Interestingly, and it hasn’t really been covered in the press yet, but there was a decision made in early December by the Yukon Supreme Court regarding the Peel River Basin. In the Northern Yukon, there is an enormous watershed that feeds into the MacKenzie River. There was a conservation consultation process that involved all the stakeholders that resulted in an agreement. But then new leadership came into power in the province and decided to change course. So the Na-Cho Nyak Dun and others went to court. Of course, it wasn’t an agreement like a treaty or even a contract, but the courts still agreed that it needed to be respected. The court ruled that the government had to go back to the consultation stage, as the proposed changes did not advance the goal of reconciliation with first nations and were “inconsistent with the honour and integrity of the crown.” This may not have been big news in Toronto, but this is a vast area of pristine land. Legally, and constitutionally, this is of huge importance. CK: So what is the Canadian public’s role in the aboriginal renaissance? Saul: If you look around, you see all of these different elements of progress. I gave that example of land management Haida Gwaii. Look at the Government of Yukon. It’s just wasted three years of its life for nothing. It’s not in the First Nations best interest, it’s not in the private sector’s interests, it’s just a waste of time for everyone. Is there no lesson in that? The only role that I have as a writer and as a thinker is to go out and say to people that you have a responsibility in this. People need to pressure every politician to deal with the aboriginal question in an open and responsible manner. It’s an argument that needs to be made, and even if one got it partially up the slope, it would change the public debate in Canada.